Get 2 Pizza Bread with your order. Extra toppings for $0.75 for each topping. Served with cheddar, mozzarella, bacon and a cup of homemade Ranch on the side. Get 4 Cheese Sticks, 4 Wings and 2 Pizza Meatballs with sauce. Get a 12 inch Potato Skin Pizza. Made with mashed potato, cheddar cheese and bacon. Get a 8 inch Potato Skin Pizza. Made with mashed potato, cheddar cheese and bacon. Always hand tossed. Available dressings: Creamy Italian, Thousand Island, Homemade Ranch, French, Fat Free Ranch, Zesty Italian, Honey Mustard, Fat Free Raspberry Vinaigrette, Poppy Seed, Apple Vinaigrette, Balsamic Vinaigrette Ask your server about our delicious, homemade Ranch Dressing now available to take home in a 16 oz. mason jar for just $7.49! Once you polish off the jar simply bring it back in and receive a refill for only $6.49! Topped with pepperoni, tomatoes, cheddar cheese and croutons. Our larger tossed salad topped with ham, pepperoni, cheese, tomatoes, black olives, smoked Applewood bacon and croutons. Our larger tossed salad topped with grilled chicken or breaded chicken strips, tomatoes, cheese and Applewood smoked bacon. Always hand tossed with the option of Grilled or Breaded Chicken. Make your own Calzone with our blend of Mozzarella and Provolone cheese and up to three toppings. Extra toppings are $1.25 each. Breaded chicken, ricotta, cheese and sauce. Ask your server about our delicious, homemade Ranch Dressing now available to take home in a 16 oz. mason jar for just $7.49! Once you polish off the jar simply bring it back in and receive a refill for only $6.49! No Pizza sauce, Just ranch dressing, chicken, onion and bacon. See sizes for prices. Loaded with ricotta and mozzarella cheese, Homemade robust sauce, and you choice of any three toppings. See sizes for prices. Enjoy the taste of Chicago in Kentucky! Topped with sausage, mushrooms and onions. See sizes for prices. Aloha! This pizza is topped with pineapple, ham and bacon. See prices for details. No pizza sauce, Just BBQ sauce and chicken. See sizes for prices. For all you veggie lovers! Topped with Onions, Mushrooms, Green Peppers, Black Olives and Fresh Tomatoes. See sizes for prices. For every meat lover! Get any of your three meat toppings of your choice. See sizes for prices. This pizza had seven toppings! Pepperoni, sausage, bacon, onions, mushrooms, green peppers and black olives. See sizes for prices. Topped with Alfredo sauce and grilled Chicken. Stephanie's Favorite Pizza! See sizes for prices. Cheese. Extra toppings are $.75 each. Cheese. Extra toppings are $1.75 each. Cheese. Extra toppings are $1.25 each. Cheese. Extra toppings are $2.00 each. Marinated roast beef with mozzarella and choice of banana peppers or jalapeno. Horseradish upon request. Cappicola ham, pepperoni, and salami topped with choice of: creamy Italian dressing, zesty Italian dressing, mayo or vinegar and oil. Topped with ham, turkey, bacon and mayo. 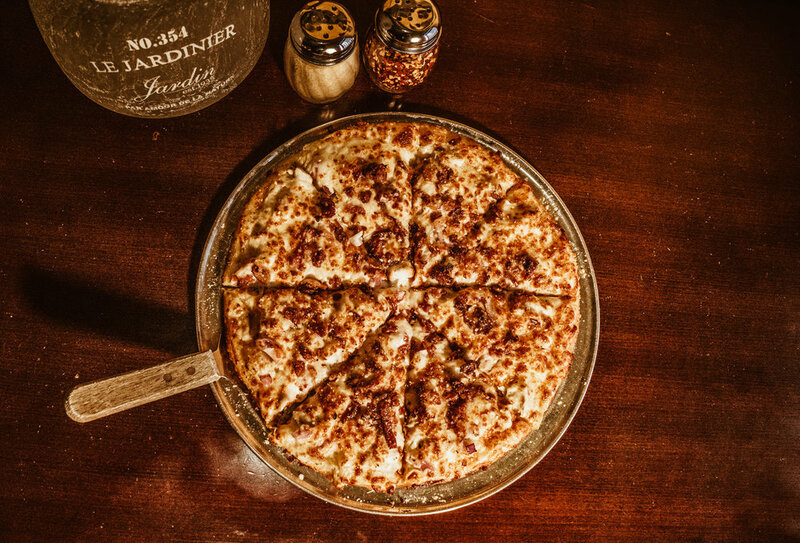 Topped with our famous pizza sauce and melted cheese. 8.5 oz. Beer battered Alaskan haddock with tater sauce on the side. Pizza or mushroom sauce, cheese and our steak patty. Topped with our robust sauce and provolone cheese. Grilled, breaded or buffalo chicken! Includes lettuce, tomato, onion, bacon and choice or ranch, blue cheese or honey mustard dressing. Up to three Veggie toppings of your choice. Extra toppings are $0.75 Each. Served with Garlic Bread. You can sub Alfredo for $1.00. Comes with two Breadsticks. With the option of Plain, hot Wet, BBQ or Parmesan Garlic. Comes with 4 oz. Crinkle Fries. No free refills on Milk. Topped with Raspberry or Chocolate drizzle.